Water flosser tips are popular because more than one person can use the same flossing device, provided they use different flosser tips.Effectively Waterpik flosser tips are for personal use, even if the flossing device is for common use. Ideally, only a Waterpik flosser tip should be used with Waterpik flosser, because there can be compatibility issues. Water flossers are for cleaning the mouth and saving on oral health expenses. They remove the remaining food particles, if any, and prevent germs from ruining teeth. Most people floss their teeth before going to bed. Waterpik flosser is known for its efficiency. In all, there are six different types of Waterpik flosser tips, each designed for addressing different types of dental problems. If you have no specific problem with your teeth, you might want to buy Waterpik “Classic Jet Tip”, which is for regular usage. Like it, the Waterpik’s “Toothbrush tip” is also for general use. Flossing teeth with braces or orthodontics requires a different construction of water flosser tip. Waterpik has designed one identified as “Orthodontic tip”. Waterpik’s “Plaque Seeker tip” is for those individuals who have any dental implants, or dental work is done in their mouth. The “Pikpocket Tip” is for “periodontal pockets” in the mouth. Apart from these five, Waterpik has a water flosser tip that serves as a tongue cleaner. These tips need to be replaced periodically. This water flosser tip is for cleaning the gaps that are there between teeth and also the part below the gum line. Within “Classic Jet” line, Waterpik offers four products, i.e., JT-70E, JT-100E, JT-360E, and JT-450E. Recommended replacement frequency for this Waterpik Flosser tip is after six months. As the name suggests it is good enough for brushing since it does have bristles. Unlike conventional toothbrushes, however, the head is small and brushes are arranged in concentric circles. It is possible to use toothpaste on this brush, but flossing with water goes on simultaneously as the person brushes with it. There is only one model of this tip, i.e., TB-100E. 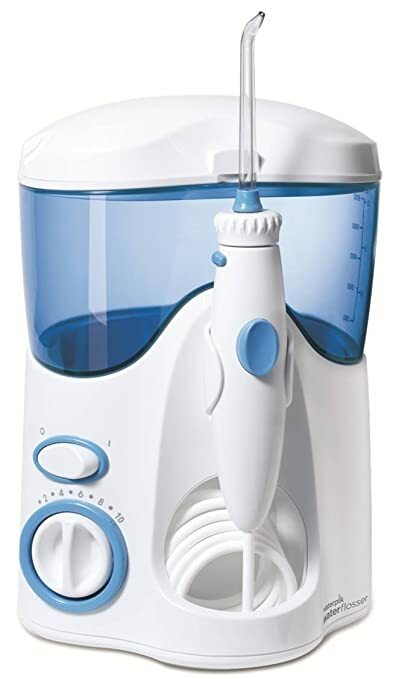 Recommended replacement frequency for this Waterpik water flosser tip is three months. This tip also has bristles but they taper on its nozzle forming a “tapered” nozzle or brush. Not only is this tip effective in removing food particles and plaque on orthodontics as well as braces, but also around gums and teeth. It is so effective that it can also be used even if the person wears no braces or orthodontics. OD-100E is the only model introduced as of now. Recommended replacement frequency for this Waterpik water flosser tip is once every quarter. Waterpik holds registered trademark for this flosser tip. The tuft of bristles on this water flosser tip consists of three uneven layers on its nozzle end. Such a structure enables the bristles to slough the plaque, especially the stubborn plaque that forms around bridges, crowns, veneers, and dental implants. There is only one model of this Waterpik flosser tip, i.e., PS-100E. Recommended frequency for replacing this flossing tip is once each quarter. Waterpik has a trademark for this flosser tip. The tip is unique because its nozzle like shape is capable of delivering either water or antibacterial solutions deeper inside what are known as “periodontal pockets” and “furcations”. Its tip needs to be placed closer to gum line at an angle of 45 degrees. 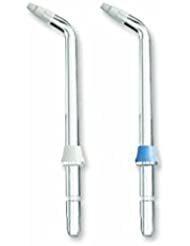 There are two models of this Waterpik flosser tip, i.e., PP-70E, and PP-100E. This tip also needs to be replaced once in each 3 months. Unlike the brush and nozzle structures, this flossing tip has a flat spoon like tip which is to be used on tongue and which with force of water used for flossing in such water flossers, removes bacteria. There are two models of this tip as well, which are TC-70E and TC-100E. This tip may be replaced once in each six months. These flosser tips need to be cleaned by soaking them in a solution containing white vinegar, or hydrogen peroxide. Soaking them for approximately 7 minutes makes them fresh again. After this, they do need to be rinsed with warm water. quite easy a child could do. Conventional methods of flossing have been replaced by gentler and yet more effective ways such as water flossing using flossers. Waterpik flossers are one of the best around for preventing oral problems and gingivitis. Waterpik flosser tips are consumables in it, and they are ‘use and discard’ parts. The fact that people do not require all tips also helps to bring down the overall costs of flossing. Moreover, most of the Special Waterpik flosser tips such as “Plaque Seeker”, ““Orthodontic” and “Pik Pocket” can also be used for general flossing. I hope you found value reading this post, if you have any questions, please leave me a message.If you liked this post, please share with your friends on social media. Sharing is caring. Hey! Thanks for this post! I had no idea about water flosser tips and to hear, immediately, that they can be used by multiple people is appealing. As you describe this device, it seems as though it can replace multiple devices, such as standard dental floss and a tongue scraper. Is that accurate? Am I reading correctly? Also, could you tell me if a water flosser feels like what is used at the dentist, or does it feel more like traditional flossing? Any issue with bleeding gums? Waterpik flosser should not replace flossing,you will still need to floss even if you`re using waterpik.Having said that, opinions do vary, some dentists say it`s enogh if you have a waterpik, some say no. I never even heard about such a device Waterpik flosser tip. Thanks for this review and actually you described all aspects and features of this unit. Does it fully replace toothbrush? I just wondering is it available portable device. I mean battery powered cordless to be backpacked for next outdoor adventure.Thanks. Waterpik flosser tip does not replace a toothbrush,you will still need your usual toothbrush.You can get smaller portable waterpic flosser that is easier totake with you in a backpack im sure. It is an excellent choice for individuals with periodontal problems, because it not only prevents tooth decay, but also reduces/removes periodontal bio-film to keep gums healthier. It is definitely a worthwhile investment if you wish to keep your teeth and gums healthy. Gum disease is a main culprit behind bad breath, so getting a handle on the gum disease would go miles toward reducing mouth odor. This post is great, very informative. 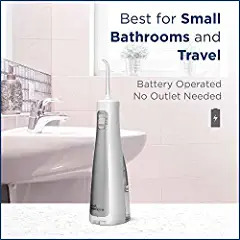 Thanks for sharing such a great device.I have never heard about the Water flosser tips but it sounds amazing in order to maintain the best oral care. This is a great review and I will chech this for my dad, because he loves to use similar devices. This will be a great gift for him. Thanks for stopping by, glad you found value reading this post and found something you can get your dad.